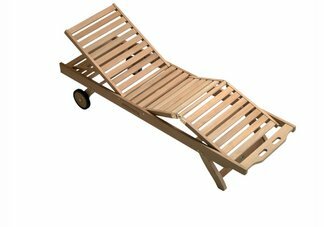 The Classic Teak Chaise Lounger is the attractive addition that you have been searching for. This Chaise Lounger is comfortable, sturdy, and durable. This is the ultimate lounger with 5 adjustable positions in the backrest and 3 for the knee tilt; perfect for reading and relaxing. The chaise lounger features a pull out drink tray on either the left or right and stores underneath. It also features rear wheels for easy mobility. Additional Information: Ships 1 per box. 8 bolts included.